Successfully owning or buying cash flow notes requires a solid plan for collecting and servicing the payments. But what happens when the note payments are late? John Moren, a 25+ year veteran of the note business, explains the issues with charging late fees on notes. In speaking with our NoteSmith loan servicing software users, I sense a lot of confusion and unnecessary creativity concerning late fees around the country. Here are some issues we have seen over the last few years. 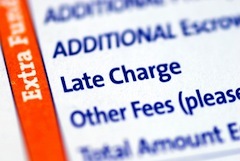 A late fee is a small, state sanctioned fee you collect as reimbursement for the nuisance of processing a late payment. Most states limit the fee to 4 or 5% of the installment amount. It is a one time, flat fee. IRS Publication 1099 (www.IRS.gov) is the instruction booklet for completing Form 1098, which summarizes a borrower’s annual mortgage interest deduction. That publication allows deducting late fees along with interest “unless the late charges are for a specific mortgage service.” A late fee of $10 on a $200 monthly payment easily can be construed as a specific service, that is, sending a late letter or making a collection call. But what about a late fee of $5 per day? First of all, this is not a single fee and violates most state law about charging more than one late fee per periodic payment. It also has a time component to it making the charge sound more like interest than a flat fee. After all, isn’t interest really just a charge per day? If you are looking for an incentive for your payors to make timely payments, a tax deductible late charge is not the way to go. We received a software question concerning a monthly payment amount of $253.06 which carried a late fee of $150.00 after 4 days. I do not know the state this was in, the collateral, or whether the payor was a natural person or a corporation (corporate payors generally can be legally and financially gouged without typical retail consumer protection). If this note ever makes it into court, a skilled attorney could have a field day with it. To answer their question, one of our support people wanted to call back and ask for the person who would be left behind when the rest of the office was in jail! We bit our tongues and faxed back politely, but more on this note later. Imagine you were holding a note that required monthly payments of $965.56. One July, you receive a check for the mortgage payment in the amount of $956.65. As a conscientious investor, you accept this partial payment, add your typical 4% late charge of $38.62, and wait patiently for the next payment. On August 1, you receive a payment for the next month of the normally expected $965.56. Still being conscientious, you apply the first $8.91 to the close out the July payment and the next $38.62 to zero the late fees owed. Now the August payment is almost fifty dollars short, so you charge another late fee. This is called “pyramiding of late fees” and, although it appears to be statistically correct, is illegal in all states of which we are aware. The reason is that one short payment caused two late fees. It does not matter if it was caused by a clerical error, a late payment, an insufficient amount, or an insufficient check, you can charge only one late fee per late payment. Almost all notes specify that the order payments will be applied is first to costs of collection, next to interest, and the remainder to reduce principal. Let’s again use a $200 monthly payment where about $170 pays the interest, about $30 goes to principal, and there is a $10 late fee after 10 days. Of course, the payor is 15 days late but sends you $200. We’ve seen servicers apply the first $170 to interest and the remaining $30 to principal. The late fee is accrued as if they expect to collect it someday. Instead, the first $10 needs to go to the late fee, which never can bear interest, then the next $170 to interest, leaving only $20 for principal reduction. The next month, interest will be higher than expected because of the principal shortfall. Continuing with the same scenario, the servicer still has a choice to make. Do they close out the month or not? According to the terms of the note, the above payment is a partial payment. If the month is not closed, then $10 is still owed. When the payor makes the next $200 payment, even if it’s on time, the first $10 goes to close out the previous month and this payment is now $10 short-and subject to a late fee if not paid within the 10 day grace period. This seems to be pyramiding, because each subsequent “timely” payment ends up with a late fee. Only one late fee is charged per payment. Payments are not timely unless the entire payment is received timely. Check with your state law before attempting to service a loan in this manner. If your law prohibits pyramiding, and if this scenario matches their description of it, then take your $200, apply the payment appropriately, and close out the month even though you have not collected all that is owed for that period. You will collect all the principal owed to you, plus interest, when the note pays off. The whole notion of late fees opens up a legal can of worms and here is the argument. Since the payor has a grace period of 10 days, the note specifically states that it is acceptable to pay at least 10 days late. Further, it implies permission to pay even later since the late fee is the payment in full for the right to make a payment after the grace period expires. Some of our software customers do not write late fees into their notes because they are afraid it may inhibit foreclosure efforts. Punishment is designed to modify behavior. A late fee is not the big stick, foreclosure is. A late fee is merely reimbursement of the costs of collection. The threat of foreclosure is the punishment that forces timely payment. Going back to late fee accruals, if you have been shorted repeatedly on the principal necessary to amortize the loan, you are in a foreclosable situation. If you have been politely applying the payments first to interest and principal, while accruing non-interest bearing late fees, it is doubtful whether you could foreclose. Would you rather go before the clerk of the court-or the court itself-with outstanding principal or outstanding late fees? I heard that once at a Jimmy Napier seminar and I have been encouraging investors to upgrade their portfolios ever since. All the creativity, punishment, and coercing you can muster is in vain if the payor does not have the financial ability-or the mental desire–to make a payment. Remember the $253.06 payment with the $150.00 late fee? The payor paid the whole amount, $403.06, and the check bounced. Written by John W. Moren, President of Princeton Investments, Inc., publisher of the original NoteSmith loan servicing software since 1988, copyright C 2012 by Princeton Investments, Inc. The NoteSmith family of loan servicing software tracks mortgage notes, discounted notes, leases, rent, and other cash flows. Loan originators, mortgage lenders, note buyers, real estate investors, attorneys, accountants, and charitable organizations know that NoteSmith products were created for them and by them.